I recently finished my 3rd UFO for this year — a beautiful, embroidered wall hanging of the birth of Jesus. This is actually the 3rd of these I made this past year. I also made one for my parents, and one for my in-laws. Each of theirs was done before this past Christmas. This one is for me, and so it had to wait until I had time to finish it. I just love this wall hanging and love how it turned out. It is absolutely beautiful! Like our parents, I may be hanging this design year-round. The picture doesn’t hardly do it justice. It doesn’t do a very good job showing the sheen of the rayon or metallic thread, or the small details in the clothing, animals, or the stable. This design is by Anita Goodesign. It was quite hard to get several of the designs to stitch without pulling quite bad, but lots of stabilizer is the key. About half the blocks are very dense and full of stitches. There are 45 thread colors, include metallic gold, silver, and bronze, and 8 different batik fabrics. It took about 50-hours total to embroider the blocks and then another 20 or so to put it all together. It measures 25″ x 29″. And call me crazy. I might just do another one or two and sell them. They really are beautiful and I know several others might like to have this beautiful nativity hanging in their house as well. 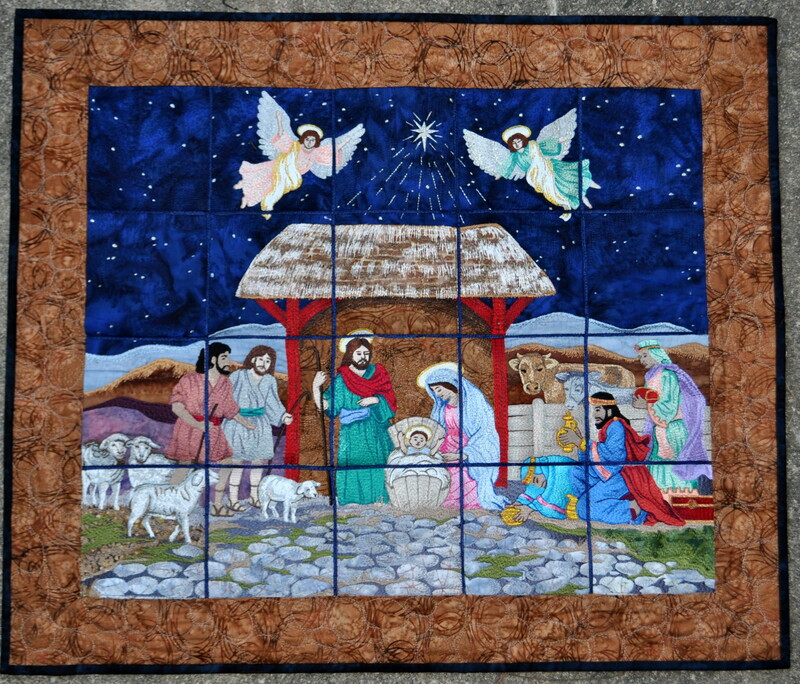 This entry was posted in Quilting/Sewing and tagged angels, embroidery, gold, jesus, joseph, mary, metallic, nativity, quilt, sheep, shepherd, silver, star, wise man by monkeyneedle. Bookmark the permalink.